“The draft riots, as they are called, were supposed by some to be the result of a deep-laid conspiracy on the part of those opposed to the war, and that the successful issue of Lee’s invasion of Pennsylvania was to be the signal for open action. Whether this be so or not, it is evident that the outbreak in New York City on the 13th of July, not only from the manner of its commencement, the absence of proper organization, and almost total absence of leadership, was not the result of a general well-understood plot. It would seem from the facts that those who started the movement had no idea at the outset of proceeding to the length they did. 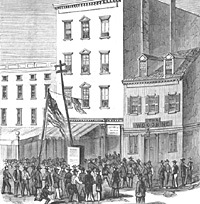 They simply desired to break up the draft in some of the upper districts of the city, and destroy the registers in which certain names were enrolled,” wrote Joel Tyler Headley in The Great Riots of New York City.1 But whether or not a conspiracy existed, New York newspaper editors were convinced one existed and wrote that one did. Busteed states that he (B) has been a member of this coterie, and attended their meetings, from the first. Appalled at the turn things are taking he has given us this warning, under the strictest pledge that his name shall be kept secret, and we shall get the facts from other sources. His life would no doubt be in danger if he were known as informant— We shall take steps at once to get at the bottom of the thing, and one means of doing it is by keeping control of this man Andrews; and the main object of this letter is to beseech of you to see that he is, under no pretext, delivered up to the State or City authorities. In Govr Seymour’s or Judge McCunn’s hands, he will know he is in no danger, and his mouth will be shut. I have written my friend, Judge Edmonds, who is now at Lake George, to come down and manage the investigation. It will need to be managed shrewdly, and should be done by a man who is not before the public as a strong party man, and therefore the Judge Edmonds is just the man. I think he will undertake it. Mr Greeley is aware of my writing this, and approves of my doing so, but as he might be accused of political hostility to the parties implicated it is best that he should take no action in the matter. Let me beg of you, my dear Mr Lincoln, to let no consideration induce you to let Andrews be given up. If you can succeed in establishing these things as facts, it will be a death blow to Copperheadism, and we shall bless God for this riot, which will then have fully unmasked our Northern traitors. I have not confidence in Busteed, and the public would believe no statement, like this, on his unsupported authority; but circumstances seem to confirm what he says. There is a very prevalent impression among the persons liable to the draft, that the act is unconstitutional. [Their?] friends profess however entire willingness to abide by the decision of the courts— In consideration of these circumstances, I beg to add my recommendation to that of Govr. [John] Andrew, that the question should be brought before the courts, at the earliest practicable moment. Iver Bernstein wrote: “During late July and the early weeks of August, Seymour tried to convince President Lincoln that the state’s draft quotas discriminated against Democratic counties, and that even if the quotas were adjusted, the draft measure was unconstitutional and unenforceable in New York City. In a bipartisan effort, Samuel Tilden and Edwin D. Morgan went to Washington to press Seymour’s arguments upon the President; if anyone could persuade Lincoln of the draft’s illegality, it was Tilden, the nervous but brilliantly articulate corporate lawyer. Lincoln rejected all Seymour’s appeals.”23 Seymour also argued that the excess troops supplied by New York at the beginning of the war should be counted against current draft quotas. The New York Governor maintained that New York had not received sufficient credit for troops raised by former Governor Morgan. At my request a number of persons have called upon you with respect to the draft in this State; more particularly as it affected the Cities of New York and Brooklyn. To avoid misapprehension I deem it proper to state my views and wishes in writing. As the draft was one of the causes of the late riot in the City of New York and as that outbreak has been urged by some as a reason for its immediate execution in that City, it is proper that I should speak of that event. At the moment when the militia of the City were absent, in pursuance of your request, and when the forces of the General Government were withdrawn from its fortifications, leaving it defenceless against any attack from abroad or from riot within its limits, the Provost Marshal commenced the draft without consultation with the authorities of the State or of the City. Allow me to call your attention to the defenceless condition of this City. I have only 550 men to garrison eight forts. One half of these cannot be called artillerists, being very imperfectly instructed in any part of artillery duty. The “Roanoake” is ordered to proceed to Hampton Roads, leaving no vessel of War in the harbor or at the dépt, that could be available in less than ten days. The militia of this City and Brooklyn have either been, or are being sent to protect and defend Pennsylvania, who is now paying dear for her neglecting to take care of herself by guarding her frontier. Is it wise for New York to follow her example by neglecting to protect the City of New York, the great emporium of the country, and of more importance at the present moment to the government, than all other cities under its control? If I had a sufficient number of men to man our guns, I might protect the City from ordinary ships of war, but not from iron clad steamers. In our present condition, from want of men to man our guns, the “Alabama” or any other vessel of her class, might without fear of injury enter our harbor, and in a few hours destroy one hundred millions of property. I have done all in my power to guard against the present condition of the city, but I have thus far been unsuccessful. I have called the attention of the mayor, as well as others, again and again, to the defenceless condition of the City. The mayor can do but little from the fact that the militia have been ordered to defend Pennsylvania. We ought to have one or two iron clad steamers and several gun boats to guard the harbor. These, with men to man the guns of our forts, would be sufficient to protect & defend the City. The company of Artillery, raised for the forts in this harbor, which I requested your Excellency to turn over to me, has been sent to Pennsylvania. The condition of the City is an invitation to rebels to make the effort to assail it. While this deplorable riot has brought disgrace upon the great City in which it occurred, it is due to the character of its population to say that they were able to put it down without aid from any other quarter; to save their City; and to rescue their own and the Government property from the violence of a mob, at a critical moment, when they had sent their armed men to save the National Capital from falling into the hands of hostile arms. For this patriotic service they have already received your thanks and the gratitude of the Nation. However much we may denounce and deplore the violence of bad or misguided men, it would be alike unjust and ungrateful to urge the execution of the draft in any spirit of resentment, or to show any unwillingness to see that the most exact justice is observed in the execution of the measure and in fixing the amount of the quotas. I am sure that you will unite with me in repelling any counsels suggested by excited passions or partisan prejudices. For you have on more than one occasion warmly acknowledged the generous and patriotic promptitude with which the City of New York has responded to calls made upon it by you in moments of sudden peril. The act of Congress providing for the conscription directs that, in determining the quotas of men to be furnished by each State, regard shall be had to the number of volunteers and militia furnished by them respectively, since the commencement of the present rebellion; and that they shall be so assigned as to equalize the number among the districts of the several States, allowing for those already furnished and for the time of their service. I believe that New York is the only Atlantic State save Rhode Island which has furnished her full quota heretofore and has also furnished a surplus which entitles here to a credit upon the present draft. But the statement made at the office of the Provost Marshal General at Washington, of the amount of this credit does not agree with that claimed at the office of the Adjutant General of this State. I do not doubt the impartiality of Colonel [James B.] Fry; and I believe that the differences of these statements can be reconciled if an opportunity is given to compare the records of the two officers. I ask that this may be done. After a careful examination I am satisfied that the quotas now demanded from the Congressional districts in New York and Kings County are glaringly unjust. Either the names enrolled in those districts greatly exceed the true numbers or the enrolments in other parts of the State are grossly deficient. The practical injustice will be the same in either case. If regard is had to the numbers heretofore sent from the several districts, the records of our State show that New York and Brooklyn have furnished more than their proportion. These records were carefully kept under the administration of Governor Morgan. If the quotas now fixed upon these Cities are proportioned to the numbers enrolled, they suffer double wrong; for they do not get a due credit for the past, and the enrolments are excessive as compared with other sections of the State. I send you tables which show these results; and I will also state here a few facts. The quota for the fourth Congressional district, with a population of 131.854 is 5.881: That fixed upon the fifteenth Congressional district with a population of 132.232 is only 2.260. The quota upon the last named district should exceed that of the City district, for the census return shows that there is a larger population of females and of aliens in the City of New York than in the country. If the comparison is made by the number of voters instead of the population, taking the last election, when the vote was very full, it will be seen that the call upon the City district is 5.881 upon a vote of 12.363, while upon the country district it is only 2.260, upon a vote of 23.165. In two adjoining districts in the City of Brooklyn the discrepancies are equally striking. In that represented by Mr. [Moses] Odell with a population of 132.242, the quota is 2.697: In the adjoining district, represented by Mr. [Marvin] Kalbfliesch, with a population of 151.951, it is 4.146. Yet the voters are in Mr. Odell’s district 16.421, and in that of Mr. Kalbfliesch 15.967. The draft, as at present proposed, will throw upon the Eastern portion of the State, comprising less than one third of the Congressional districts, more than one half of the burthens of the conscription. This is particularly unjust towards New York and Brooklyn, for they have not only furnished their free proportions heretofore, without counting the numbers they have given to the navy of the country, but they have been the recruiting grounds for other States; and constant complaints are now made that Agents from other States are now employed for that purpose within those cities and are hiring persons there to act as substitutes, thus reducing, still more, the number of persons who will be compelled to meet this undue demand which obliges them to leave their families and their homes and to peril their lives, if they are less fortunate than others in their ability to pay the sum fixed, as a commutation. I earnestly request that you will direct that the enrolling officers shall submit to the State authorities their lists, and that an opportunity shall be given to me — , as Governor of this State, and to other proper State officials, to look into the fairness of these proceedings. Justice to the enrolling officers, to the honor and dignity of the Government, to the People who are so deeply affected and to the public tranquility, demands that the suspicions, which are entertained, shall be removed if they are unfounded. It is just to add that the administration owes this, to itself, as these inequalities fall most heavily upon those districts which have been opposed to its political views. I am sure that this fact will strengthen your purpose to see that justice is done. The enrolments are only completed in about one half of the districts. The results were sent to me at intervals during the month of July; but were only recently received by me, in consequence of my absence, at the City of New York. I am confident you will agree with me that the public interest in every respect will be promoted by affording the fullest evidence of the faithfulness and impartiality with which the conscription is conducted. In the meanwhile large numbers are availing themselves of the bounties offered by the State and National Governments, and are voluntarily enlisting, thus mitigating the distress which a compulsory draft necessarily carries into the homes of our people. The State of New York offers liberal bounties to those who enlist. I believe it will be found that the abandonment of voluntary enlistment for a forced conscription will prove to be unfortunate as a policy; that it will not secure either so many or so effective men, as that system which one year since gave to this Government the largest army ever raised within so short a space of time by the voluntary action of any people. I do not propose to discuss, in this connection, the reasons why the People withhold the support heretofore so cheerfully rendered. Hereafter I shall make that the subject of another communication. But assuming it to be due to the exhaustion of the number of those able to bear arms, it would only prove how heavily this new demand falls upon the productive interests and labor of our country, and it makes another reason why the heavy burthens of the conscription should be tempered by every act calculated to remove suspicions and to ally excitement. Above all it should induce every effort to get voluntary enlistments, which fall less heavily upon the domestic happiness and business arrangements of our citizens. I ask that the draft may be suspended in this State, as has been done elsewhere, until we shall learn the results of recruiting which is now actively going on throughout the State, and particularly in the City of New York. I am advised that large numbers are now volunteering. Whatever credit shall hereafter be allowed to this State, it is certain that there is a balance in its favor. It is but just that the delinquent States should make up their deficiency before New York, which has so freely and generously responded, to the calls of the Government, shall be refused the opportunity to continue its voluntary support of the armies of the Union. There is another point which profoundly excites the public mind, which has been brought to your attention by persons from this and other States. Our People have been taught that laws must be upheld and respected at every cost and every sacrifice; that the conscription act, which demands their persons and perhaps their lives must be promptly obeyed, because it is a statute of our Government. To support the majesty of law a million of men have gone forth from Northern homes to the battle fields of the South; more than three hundred thousand have been laid in bloody graves or have perished in lingering disease. The guilt of the rebellion consists in raising an armed hand against Constitutional or legal obligations. The soldier who has given up his life, the capitalist who has contributed his treasure, the mechanic and the laborer who have paid to the tax gatherer the earnings of their toil have cheerfully made these sacrifices, because they saw, in the power of laws, not only obligations to obedience but protection to their rights, to their persons and to their homes. It is this protection which alone gives value to Government. It is believed, by at least one half of the People of the loyal States, that the conscription act, which they are called upon to obey, because it stands upon the Statute book, is in itself a violation of the supreme Constitutional law. There is a fear and suspicion that while they are threatened with the severest penalties of the law, they are to be deprived of its protection. In the minds of the American People, the duty of obedience and the right to protection are inseparable. If it is therefore proposed, on the one hand, to exact obedience at the point of the bayonet, and upon the other hand, to shut off by military power, all approach to our judicial tribunals, and to deny redress for wrongs, we have reason to fear the most ruinous results. These disasters may be produced as well by bringing laws into contempt, and by a destruction of respect for the decisions of courts as by open resistance. This Government and our People have more to fear from an acquiescence in the disorganizing teachings that war suspends their legal rights or destroys their legal remedy than they have to fear from resistance to the doctrine that measures can be enforced without regard to the decisions of judicial tribunals. The refusal of Governments to give protection excites citizens to disobedience— The successfull [sic] execution of the conscription act depends upon the settlement, by judicial tribunals, of its constitutionality. With such decisions in its favor, it will have a hold upon the public respect and deference which it now lacks. A refusal to submit it to this test will be regarded as evidence that it wants legality and binding force. A measure so unusual in the history of this country, which jars so harshly with those ideas of voluntary action, which have so long prevailed in this community, and which have been so conspicuous in the conduct of this war, should go forth with all the sanctions of every department of our Government, the Legislative, the Executive, and the Judicial. With such sanctions it would overcome the hostility which it naturally creates in the minds of a People conscious of their patriotism and jealous of their rights. I earnestly urge that the Government interpose no obstructions to the earliest practicable judicial decision upon this point. Our accustomed procedures give to our citizens the right to bring all questions affecting personal liberty or compulsory service, in a direct and summary manner, to the Judges and courts of the State or Nation. The decisions which would thus naturally be rendered within a brief period, and after full and ample discussion, would make such a current of judicial opinion as would satisfy the public mind that the act is either valid or void. The right of this Government to enforce military service in any other mode than that pointed out by the Constitution cannot be established by a violent enforcement of the Statute. It must be determined ultimately by the judiciary. It should be determined, in advance of any enforcement which must be destructive to so many lives. It would be a cruel mockery to withhold such decision until after the irremediable injury of its execution upon — those who are unable to pay the sum demanded in lieu of their persons. Those who are able to commute might have their remedy by recovery of the money paid in commutation. No evils are to be feared if the law should be pronounced unconstitutional. The submission of this Government to the decisions of our courts would give it a new and stronger hold upon the public confidence; it would add new vigor to our system of Government; and it would call forth another exhibition of voluntary offerings, of men and treasure, to uphold an administration which should thus defend and respect the rights of the People. The spirit of lawlessness in our land would be rebuked; respect for legal obligations in our land would be invigorated; confidence in our government would be strengthened; the dissentions and jealousies at the North, which now, weaken our cause, would at once be healed up, and your voice would be potential in calling forth the power and force of a united people. By what willing strength has done in the past, you may foresee what willing and united strength may accomplish in the future. It cannot be said of New York, — I believe it cannot be said of any Northern State, — that if the conscription act be declared unconstitutional, the Nation is thereby abandoned to weakness and paralysis. Be assured such a fate can never befall a Government which represents the convictions of the People, which works with the spirit and provisions of the Constitution. It is no more possible, under such circumstances, that the Nation should be left in helplessness, than that the strong man’s army should refuse to obey his will. If this bill which stands upon the assumed right of Congress to pass such an act, shall fall to the ground, there is still left the undisputed authority to call forth the armed power of the Nation in the manner distinctly set forth in the Constitution of our country. I do not dwell upon what I believe would be the consequence of a violent, harsh policy before the Constitutionality of the act is tested. You can scan the immediate future as well as I. The temper of the People today you can readily learn, by consulting, as I have done, with men of all political parties, and of every profession and occupation. The Nation’s strength is in the hearts of the People. Estrange them; divide them; and the foundations fail: the structure must perish. Your communication of the 3rd. Inst. has been received, and attentively considered. I can not consent to suspend the draft in New-York, as you request, because, among other reasons, time is too important. By the figures you send, which I presume are correct, the twelve Districts represented fall into classes of eight, and four respectively. The disparity of the quotas for the draft, in these two classes is certainly very striking, being the difference between an average of 2200 in one class, and 4864 in the other. Assuming that the Districts are equal, one to another, in entire population, as required by the plan on which they were made, this disparity is such as to require attention. Much of it, however, I suppose will be accounted for by the fact that so many more persons fit for soldiers, are in the city than are in the country, who have too recently arrived from other parts of the United States and from Europe to be either included in the Census of 1860, or to have voted in 1862. Still, making due allowance for this, I am yet unwilling to stand upon it as an entirely sufficient explanation of the great disparity. I shall direct the draft to proceed in all the Districts, drawing however, at first, from each of the four Districts, towit: the second, fourth, sixth, and eighth, only 2200, being the average quota of the other class. After this drawing, these four Districts, and also the seventeenth and twenty-ninth, shall be carefully re-enrolled, and, if you please, agents of yours may witness every step of the process. Any deficiency which may appear by the new enrollment will be supplied by a special draft for that object, allowing due credit for volunteers who may be obtained from these Districts respectively, during the interval. And at all points, so far as consistent, with practical convenience, due credits will be given for volunteers; and your Excellency shall be notified of the time fixed for commencing a draft in each District. I do not object to abide a decision of the United States Supreme Court, or of the judges thereof, on the constitutionality of the draft law. In fact, I should be willing to facilitate the obtaining of it; but I can not consent to lose the time while it is being obtained. We are contending with an enemy who, as I understand, drives every able bodied man he can reach, into his ranks, very much as a butcher drives bullocks into a slaughter-pen. No time is wasted, to argument is used. This produces an army which will soon turn upon our now victorious soldiers already in the field, if they shall not be sustained by recruits, as they should be. It produces an army with a rapidity not to be matched on our side, if we first waste time to re-experiment with the volunteer system, already deemed by congress, and palpably, in fact, so far exhausted, as to be inadequate; and then more time, to obtain a court decision, as to whether a law is constitutional, which requires a part of those not now in the service, to go to the aid of those who are already in it; and still more time, to determine with absolute certainty, that we get those, who are to go, in the precisely legal proportion, to those who are not to go. I received your communication of the 7th instant this morning. While I recognize the concessions you have made I regret your refusal to comply with my request to have the draft in this State suspended until it can be ascertained if the enrolments are made in accordance with the laws of Congress or with principles of justice. I know that our army needs recruits and for this among other reasons I regret a decision which stands in the way of a prompt and cheerful movement to fill up the thinned ranks of our regiments. New York has never paused in its efforts to send volunteers to the assistance of our gallant soldiers in the field. It has not only met every call heretofore made, while every other Atlantic and each New England State save Rhode Island was delinquent but it continued liberal bounties to volunteers when all efforts were suspended in many other quarters. Active exertions are now made to organize new and to fill up old regiments. These exertions would be more successful if the draft was suspended and much better men than reluctant conscripts would join our armies. I telegraphed the Provost Marshal General this morning that there ought to be ten thousand troops in this City & Harbor when the draft is resumed, and that with such a force it may be commenced on Monday. This force is the smallest estimated by any one as necessary to hold the forts, provide for the safety of the public property in the City and overawe resistance to the draft. Although Genl [Edward R. S.] Canby has 5000 men they are much scattered & not more than 2000 would be available for service in the City. The interests the government has in this City, independently of the importance of preventing any open opposition to its authority, are too great to be put at hazard by want of adequate preparation; and I am constrained to believe that the whole moral influence of the Executive power of the State will be thrown against the execution of the law for enrolling and calling out the National forces, and a case may occur, in which the military power of the State will be employed to defeat it. If this case arises, or is likely to arise, I shall promptly declare martial law & suspend the civil authority. In connexion with this subject it becomes of the gravest importance to consider the extent of the Presidents authority over the militia of this city and state. By the first section of the act of 29 July, 1861, Chap 25, the President is authorized to call forth the Militia of any or all the states whenever by reason of unlawful obstructions, combinations, &c, it is impracticable in his judgment to enforce the laws, &c. This and Sec. 2nd of the same act are substitutes for Secs 2 & 3, of the Act of Feb 28. 1795. Chap, 36. The Supreme Court of the U. S. 12 Wheaton, Martin v. Mott held that “the authority to decide whether the exigency has arisen belongs exclusively to the President and that his decision is conclusive upon all other persons.” Though not in the order of dates, I begin with this interpretation because it is applicable to all the cases that can arise for the exercise of the Presidents power under the acts authorizing him to call forth the militia. If I find it necessary to declare Martial law I may also find it necessary to ask the President to call Genl Sanford’s division into the service of the United States and to address the order directly to him. It may be the more important as intimations have been thrown out by persons officially connected with Governor Seymour that the Militia of the City may be used to protect its citizens against the draft in certain contingencies; and it is quite possible that such a contingency may arise in the progress of judicial proceedings instituted to release individuals from the operation of the act for enrolling & calling forth the militia. Whereas, in the judgment of the President, it is necessary to use the Military force in the State of New York in order to suppress existing unlawful combinations against the enforcement of the laws of the United States. Therefore, I, Abraham Lincoln, President of the United States, do hereby command all persons acting against the enforcement of said laws, to disperse and return peaceably to their respective abodes, by and before … o’clock … M of this day. Your despatch of this morning is just received; and, I fear I do not perfectly understand it. My view of the principle is, that every soldier obtained voluntarily, leaves one less to be obtained by draft. The only difficulty is, in applying the principle properly. Looking to time, as heretofore, I am unwilling to give up a drafted man now, even for the certainty, much less for the mere chance, of getting a volunteer, hereafter. Again, after the draft in any District, would it not make trouble to take any drafted man out, and put a volunteer in; for how shall it be determined which drafted man is to have the privilege of thus going out, to the exclusion of all the others? That the principle of giving credits for volunteers shall be applied by Districts, seems fair and proper, though I do not know how far, by present statistics, it is practicable. Joel Tyler Headley, The Great Riots of New York City, p. 145. Sidney David Brummer, Political History of New York State During the Period of the Civil War, p. 323. George Fort Milton, Abraham Lincoln and the Fifth Column, p. 148. Augustus Maverick, Henry J. Raymond and the New York Press for Thirty Years, p. 166. Stewart Mitchell, Horatio Seymour of New York, p. 308. Harry Houston Peckham, Gotham Yankee: A Biography of William Cullen Bryant, p. 154. Curtiss S. Johnson, Politics and A Belly-full: The Journalist Career of William Cullen Bryant, p. 121. Elmer Davis, History of The New York Times, 1851-1921, p. 60. William B. Hesseltine, Lincoln and the War Governors, p. 299. Stewart Mitchell, Horatio Seymour of New York, p. 305. Gideon Welles, Diary of Gideon Welles, Volume I, p. 373 (July 15, 1863). James Harrison Wilson, The Life of Charles A. Dana, p. 249-250. Allan Nevins, editor, Diary of the Civil War, 1860-1865: George Templeton Strong, p. 345 (July 27, 1863). William O. Stoddard, Lincoln’s Third Secretary, p. 186-187. Philip S. Paludan, The Presidency of Abraham Lincoln, p. 213-214. Sidney David Brummer, Political History of New York State During the Period of the Civil War, p. 333. Abraham Lincoln Papers at the Library of Congress. Transcribed and Annotated by the Lincoln Studies Center, Knox College. Galesburg, Illinois. (Letter from James R. Gilmore to Abraham Lincoln, July 17, 1863). Carl Sandburg, Abraham Lincoln: The War Years, Volume III, p. 368. Don E. and Virginia Fehrenbacher, editor, Recollected Words of Abraham Lincoln, p. 175 (from James R. Gilmore , Personal Recollections of Abraham Lincoln and the Civil War, p. 199). Philip S. Paludan, The Presidency of Abraham Lincoln, p. 213. Abraham Lincoln Papers at the Library of Congress. Transcribed and Annotated by the Lincoln Studies Center, Knox College. Galesburg, Illinois. (Letter from Horatio Seymour to Abraham Lincoln [With Endorsement by Lincoln], July 19, 1863). Stewart Mitchell, Horatio Seymour of New York, p. 344 (Letter from Horatio Seymour to Samuel Tilden, August 6, 1863). Abraham Lincoln Papers at the Library of Congress. Transcribed and Annotated by the Lincoln Studies Center, Knox College. Galesburg, Illinois. (Letter from David D. Field to Abraham Lincoln, July 19, 1863). Iver Bernstein, The New York City Draft Riots, p. 63. Gideon Welles, Diary of Gideon Welles, Volume I, p. 380 (July 23, 1863). Sidney David Brummer, Political History of New York State During the Period of the Civil War, p. 324 (New York Daily News, August 1863). Abraham Lincoln Papers at the Library of Congress. Transcribed and Annotated by the Lincoln Studies Center, Knox College. Galesburg, Illinois. (Letter from Preston King to Abraham Lincoln, July 29, 1863). Stewart Mitchell, Horatio Seymour of New York, p. 345. Sidney David Brummer, Political History of New York State During the Period of the Civil War, p. 325-326. Stewart Mitchell, Horatio Seymour of New York, p. 341. Roy P. Basler, editor, The Collected Works of Abraham Lincoln, Volume VI, p. 361 (Letter to Horatio Seymour, August 1, 1863). Abraham Lincoln Papers at the Library of Congress. Transcribed and Annotated by the Lincoln Studies Center, Knox College. Galesburg, Illinois. (Letter from Horatio Seymour to Abraham Lincoln, August 3, 1863). Roy P. Basler, editor, The Collected Works of Abraham Lincoln, Volume VII, p. 370 (Letter from Horatio Seymour to Abraham Lincoln, August 3, 1863). Abraham Lincoln Papers at the Library of Congress. Transcribed and Annotated by the Lincoln Studies Center, Knox College. Galesburg, Illinois. (Letter from Horatio Seymour to Abraham Lincoln, August 7, 1863). Roy P. Basler, editor, The Collected Works of Abraham Lincoln, Volume VII, p. 369-370 (Letter to Horatio Seymour, August 7, 1863). Gideon Welles, Diary of Gideon Welles, Volume I, p. 395 (August 7, 1864). Sidney David Brummer, Political History of New York State During the Period of the Civil War, p. 329-330. Sidney David Brummer, Political History of New York State During the Period of the Civil War, p. 330. Stephen B. Oates, With Malice Toward None, p. 358. David Donald, Lincoln, p. 450. Stewart Mitchell, Horatio Seymour of New York, p. 343 (See James B. Fry, LNew York and Conscription, pp. 35-36). Allan Nevins, editor, Diary of the Civil War, 1860-1865: George Templeton Strong, p. 348 (August 17, 1863). Carl Sandburg, Abraham Lincoln: The War Years, Volume III, p. 377. Philip S. Paludan, The Presidency of Abraham Lincoln, p. 214. Roy P. Basler, editor, The Collected Works of Abraham Lincoln, Volume VII, p. 410 (Letter to James C. Conkling, August 26, 1863). Abraham Lincoln Papers at the Library of Congress. Transcribed and Annotated by the Lincoln Studies Center, Knox College. Galesburg, Illinois. (Letter from Horatio Seymour to Abraham Lincoln, August 8, 1863). Abraham Lincoln Papers at the Library of Congress. Transcribed and Annotated by the Lincoln Studies Center, Knox College. Galesburg, Illinois. (Letter from Abraham Lincoln to Horatio Seymour , August 11, 1863). Abraham Lincoln Papers at the Library of Congress. Transcribed and Annotated by the Lincoln Studies Center, Knox College. Galesburg, Illinois. (Letter from John A. Dix to Edwin M. Stanton , August 12, 1863). Abraham Lincoln Papers at the Library of Congress. Transcribed and Annotated by the Lincoln Studies Center, Knox College. Galesburg, Illinois. (Abraham Lincoln, Proclamation, August 15, 1863). Abraham Lincoln Papers at the Library of Congress. Transcribed and Annotated by the Lincoln Studies Center, Knox College. Galesburg, Illinois. (Letter from Horatio Seymour to Abraham Lincoln , August 16, 1863). Abraham Lincoln Papers at the Library of Congress. Transcribed and Annotated by the Lincoln Studies Center, Knox College. Galesburg, Illinois. (Letter from Abraham Lincoln to Horatio Seymour, August 16, 1863). Abraham Lincoln Papers at the Library of Congress. Transcribed and Annotated by the Lincoln Studies Center, Knox College. Galesburg, Illinois. (Letter from Abraham Lincoln to Edwin M. Stanton, August 26, 1863). Sidney David Brummer, Political History of New York State During the Period of the Civil War, p. 356.